THE CONCACAF Caribbean Zone preliminary championship round continues tonight at the National Stadium at 8:00 with an all important match between Trinidad and Haiti. A win for Trinidad will place them one point ahead of Jamaica who now leads on the standings board, and it will place Haiti in the cellar along with the Netherland Antilles and Cuba. If Trinidad loses, Haiti will tie with Jamaica the first position, Trinidad will remain in second position, and Cuba and the Netherland Antilles will be at the bottom. draw for them will secure a first place together with Jamaica, with three points. "It is unlikely that there will be any major change in our Friday night's team," said John Alleyne, Trinidad's team manager. Their selection committee will meet this morning to select the team for tonight. Mr. Alleyne said that no member of the selection committee has expressed dissatisfaction with the performances of any player on Friday's team so there might not be any change. mettle in an international match — unless some unfortunate incident would force Mouttet out of the game. 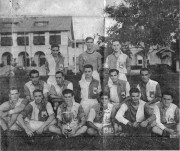 The team's captain Sedley Joseph will be in his regular position as linkman, and the dangerous team of Everald Cummings, Alvin Corneal and Warren Archibald in the forward, could well be an effective thorn to Haiti's defence. There will be one change in Haiti's set up — the half, Wilson Thomas will be out and Formose Gilles will take his place. To assist lanky Philipp Vobre, the dangerous linkman. The Haitians have surprised many fans with their brilliant draw with Cuba on Thursday night. The team's forward and half line is well balanced, although there was signs of weaknesses in the defence. Since no other change will be made on the Haitian's side, it is assumed that their able coach Antoine Tassy is dealing with that shortcoming in another method. The dangermen of the goal hungry Haitian forward are Gabriel Fleury, Joseph Pierre and Filix Poze who scored the equalizing penalty against Cuba. All the above forwards are dangerous because of their deadly long-shots. This match might prove very interesting and spectators should see a stiff game of football as the two teams enter the arena with strong determination to win.